Toady’s the first day of summer and as anyone can tell you, it can get pretty hot in Sacramento. With today’s temps expected to be in the high 90’s (F), it is essential to find ways to beat the heat. The Centers for Disease Control and Prevention provide numerous tips for preventing heat-related illness, such as never leaving anyone alone in a parked vehicle. Air conditioned places include Arden Fair Mall, Country Club Lanes, the Del Paso Heights Library, and the North Sacramento-Hagginwood Library. Pools such as Johnston Pool, Doyle Pool, Mama Marks Play Pool, and Robertson Play Pool are also good ways to cool off. Pet’s also need care in the heat. The ASPCA suggests giving them plenty of shady spots and not leaving them in parked vehicles. 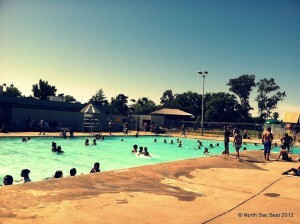 June 20, 2012 in Del Paso Heights, North Sacramento, Summer.